The Children's Safety Village is an educational center specifically designed to teach road safety to children in grades two, three and four. 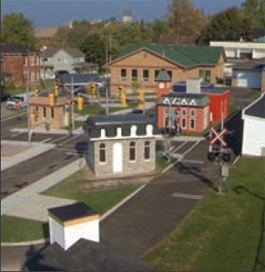 The Village features small buildings, detailed roadways, traffic lights, an operational rail-way crossing, mini vehicles, bicycles and a safety classroom. The Children's Safety Village is built on the property of the Belleville Police Service, with the help of local businesses and private sponsors. We are proud to say it is being "built by the community for the community". The Children's Safety Village is a non profit organization with charitable tax status. It is governed by a Board of Directors. Children will receive classroom instruction in combination with practical experience in the controlled environment of the miniature village. Grade two students receive instruction on pedestrian safety along with walking the streets and sidewalks. Grade three students receive basic instruction on road safety along with driving battery powered cars. Grade four students receive instruction on bicycle safety along with riding bicycles. You can also book an appointment through the Hastings Prince Edward School board. Hey Kids, check out the Scruff McGruff website, click here.